The ongoing humanitarian crisis in Puerto Rico is a product of brutal austerity and inept leadership. More than a month after Hurricane Maria swept through Puerto Rico — destroying houses, flooding streets, and laying waste to basic infrastructure — 80 percent of the island is still without electricity, and huge swathes lack clean water, adequate food, or a safe dwelling. The causes of the ongoing crisis go beyond the immense power of the natural disaster. Over the last decade, austerity policies have ravaged the island, deepening the rot of an economic model built on transferring public money to private hands. The inadequate preparation and the insufficient response to Maria were a direct result, shrinking the resources available to manage such a catastrophic situation. And government incompetence, both at the federal and local levels, made things even worse. If the island is still reeling, it’s because of disasters as much human-made as natural. In many ways, Hurricane Maria just hastened the timeline of an impending crisis, hurling the island toward a disastrous destination many had seen on the horizon. Puerto Rico has been suffering through an economic recession since 2006. On the eve of the hurricane, as the island entered its second decade in the economic doldrums, there were no signs of relief. Massive public and private indebtedness, generalized corruption, increased emigration to the mainland of the US, expanding inequality and poverty — everything pointed to the continuing incapacity of the Puerto Rican economy to serve the needs of its citizens. State incentives sustained the profits of a parasitic private sector, with no comprehensive industrial plan behind them (and no analysis of their effects to see if purported aims were realized). It was a classic case of socializing costs and privatizing benefits — and, because the firms that benefited still didn’t increase their economic activity, it meant less resources and more debt for the government. Some economists wisely stressed the need for the state to engage in direct public and planned investment. But those calls went unheeded, and a suite of structural-adjustment policies were implemented instead, hemorrhaging public resources and employees. Austerity kicked into high gear in 2009, when more than thirty thousand public employees were fired in less than a week. Five years later, authorities froze collective bargaining in the public sector and stopped recruiting new government employees. These and other budget-cutting measures, implemented by different administrations, left many public bodies — from the Department of the Family to the University of Puerto Rico — understaffed and under-resourced. Then last year Congress passed, and Barack Obama signed, a bill that added an insidious twist to the mix: the Puerto Rico Oversight Management and Stability Act (PROMESA). The somnolently titled legislation set up a Fiscal Control Board that stripped Puerto Rican government of its relative autonomy in fiscal matters. The purpose of the new body was to reduce public spending and try to guarantee Puerto Rico’s debt — now in the tens of billions of dollars — would be repaid. The board’s establishment didn’t represent an absolute rupture. While the body was rightly denounced as a colonial imposition, the substantive differences between the Fiscal Control Board and the government were relatively superficial. The fate of public employees was a case in point. On the one side was the conservative local government, which supposedly recognized the negative impact of trimming working hours for public employees and had identified other sources of savings. On the other was the Fiscal Control Board, which argued that the reduction in working hours was already set in stone — it was part of the fiscal plan the government had initially agreed to and, therefore, official public policy to be implemented. Both parties, in other words, were committed to balancing the budget and making sure the bondholders got their money back. The debate was simply about whether to further slash the public employee rolls, or keep the same number while reducing their weekly hours. No significant discussion ever took place about the corporate welfare arrangement depriving the public coffers of millions of dollars every year. Before long, though, reality would intrude. In mid-September, Hurricane Irma, a Category 4 storm, barreled toward Puerto Rico. The island’s government activated a contingency plan, expecting the gales to hit the island. But the plan looked more like a public relations event than a prophalyctic against mass destruction. As the hurricane approached, the governmental bureaucracy was simply called out to express its full engagement with the governor’s plan. Thankfully, the island did not sustain a direct hit (although the tropical-storm-strength winds did knock down some trees and electric posts). But even after the near miss, the public relations strategy simply continued: the relatively quick reestablishment of electricity was attributed to the leadership of the governor rather than the efforts of public servants, in collaboration with self-organized communities. A couple days after Irma, María, a Category 5 hurricane, appeared on the radar for Puerto Rico. This time, the storm hit with full force — the strongest and deadliest hurricane to pummel the island in nearly a century. Thanks to the lack of public personnel and resources, a total electrical blackout hung over the island for days. Access to clean and drinkable water was basically nonexistent. Diesel needed to keep electrical generators going in hospitals, gas stations, and supermarkets was not distributed on time, which cut off access to gas and food for most of the population. President Trump was rightly pilloried for his inept response to such devastation. But it took the local government a whole week to realize it did not have enough personnel to counter the catastrophe — austerity had trimmed public employment by more than 25 percent in the last ten years. When the federal government did involve itself, the Federal Emergency Management Agency (FEMA) took control of the ports and emergency funds, screening the humanitarian help as it arrived and effectively stopping any aid from countries like Venezuela and Cuba. The US army was also activated, a move that for many seemed to provide more stability to the process of distributing diesel and provisions. But this was basically limited to the sectors within and surrounding the metropolitan area. Rural areas are still electricity-free wastelands. The strength of Maria alone would’ve been devastating to Puerto Ricans. But because of government incompetence and brutal austerity, disaster reached cataclysmic proportions. There still seems to be no end in sight to the humanitarian crisis in Puerto Rico. While the local and federal government celebrate their “efficient response,” the death toll keeps rising. At the same time, the vultures of finance have again swooped in, offering additional loans to the beleaguered island while more and more of its citizens contemplate joining the emigration wave. Further privatization is also afoot. Obscure deals are being made with mainland firms to restore electrical power in the island, and the local government and the Fiscal Control Board are on the same page about privatizing the electrical utility company. What will come out of this crisis is difficult to predict. 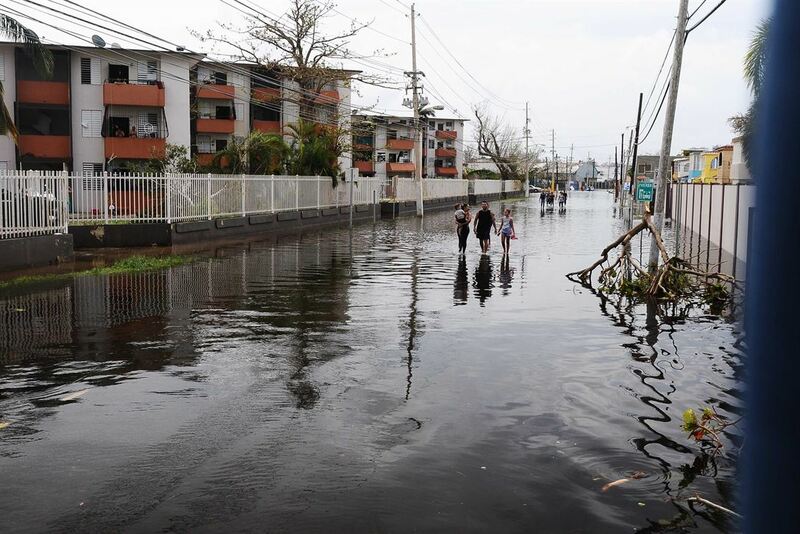 Political pressure from the diaspora, internal political struggles, and the actions of other countries will all play a role in shaping the post-Maria future. But one thing is clear. Puerto Rico and its citizens are entering uncharted terrain. The future is up for grabs. Ian J. Seda-Irizarry, PhD, is an assistant professor in the department of economics at John Jay College in New York. Heriberto Martínez-Otero, MA, is a consultant on economic and public policy matters.